Armadillo Painting proudly supports and contributes financially to the YMCA in support of its mission. Alongside generous donors, the Y strengthens communities for kids, adults, seniors and families with programs that protect, teach, connect, heal, nourish and encourage. 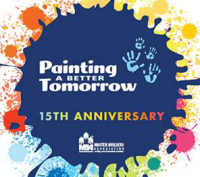 Armadillo Painting proudly participates in the Master Builder’s Association annual “Painting for a Better Tomorrow” event. Volunteers help service organizations throughout King and Snohomish county with their otherwise unmet painting needs. LIKE TO SEE OUR WORK? Visit our gallery of recent projects. We have examples of residential painting, Commercial painting and Multifamily Painting projects in our service area around the Greater Seattle Area: Seattle, Bellevue, Issaquah, Sammamish, Newcastle, West-Seattle, Woodinville, Kirkland, Redmond, Fall City, Shoreline, Renton, Maple Valley and beyond! WHY CHOOSE US FOR YOUR NEXT PAINTING PROJECT? We are your local painting experts. With our skilled crews, high standards for safety, and respect for your property, we provide the highest customer satisfaction. Our clear communication and accurate schedules ensure you will know where we are at every step of the process. We care about our work! Read what our customers are saying about our work!